Until recently, the model for Flash implementation has been to use SLC for the enterprise and MLC for the consumer. MLC solutions traded endurance, performance, and reliability for a lower cost while SLC solutions didn’t. The tradeoff of 10x the endurance for 2x the price led most enterprise applications to adopt SLC. But there is a shift taking place in the industry as SSD prices start to align with the prices enterprise customers have been paying for tier 1 HDD storage (which is much higher than the cost of consumer drives). If the per-GB pricing is similar, you can add so much more capacity that endurance becomes less of a concern. 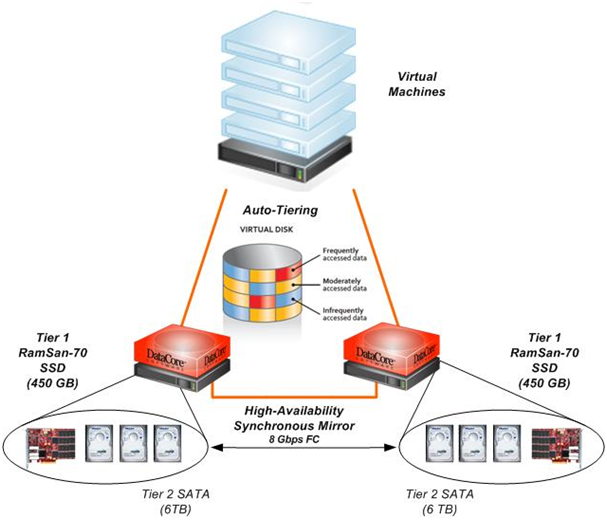 Rather than only having highly transactional OLTP systems on SSDs, you can move virtually every application using tier 1 HDD storage to SSD. The biggest concern for tier 1 storage has been that the most critical datasets that reside on them cannot risk a full 10x drop in endurance. At first glance, enterprise MLC (eMLC) sounds like Marketing is trying to pull a fast one. If there was a simple way to make MLC have higher endurance, why bother restricting it from consumer applications? eMLC sports endurance levels of 30,000 write cycles, whereas some of the newest MLC only has 3,000 write cycles (SLC endurance is generally 100,000 write cycles). There is a big reason for this restriction: eMLC makes a tradeoff to enable this endurance – retention. It’s not commonly understood that although Flash is considered persistent, the data is slowly lost over time. For most Flash chips the retention is around 10 years – longer than most use cases. With eMLC, longer program and erase times are used with different voltage levels than MLC to increase the endurance. These changes reduce the retention to as low as three months for eMLC. This is plenty of retention for an enterprise storage system that can manage the Flash behind the scenes, but it makes eMLC impractical for consumer applications. Imagine if you didn’t get around to copying photos from your camera within a three month window and lost all the pictures! Today, Texas Memory Systems announced its first eMLC RamSan product: the RamSan-810. This is a major announcement as we have investigated eMLC for some time (I have briefed analysts on eMLC for almost a year; here is a discussion of eMLC from Silverton Consulting, and a recent one from Storage Switzerland). TMS was not the first company to introduce an eMLC product as the RamSan’s extremely high performance backplane and interfaces make endurance concerns more palpable. However, with the latest eMLC chips, we aggregate enough capacity to be comfortable introducing an eMLC product that bears the RamSan name. 10 TB of capacity multiplied by 30,000 write cycles equates to 300 PB of lifetime writes. This amount of total writes is difficult to achieve during the lifetime of a storage device, even at the high bandwidth the RamSan-810 can support. Applications that demand the highest performance and those with more limited capacity requirements will still be served best by an SLC solution, but very high capacity SSD deployments will shift to eMLC. With a density of 10 TB per rack unit, petabyte scale SSD deployments are now a realistic deployment option. We’re just getting warmed up discussing eMLC. Stay tuned for another post soon on tier 1 disk pricing vs. eMLC. There is lots of confusion out there on how SSDs handle writes and I thought it would be worthwhile to shed some light on this. Flash chips need to have entire blocks (256 KB) written and erased at the same time. Since applications write in smaller chunks than this, there is something called a Flash Translation Layer that handles write I/Os. I’ll try to summarize the details here. The Flash Translation Layer keeps an index of where a block is physically written and the logical address that is presented to the host. After a continuous small block random write workload, eventually there are not any pre erased blocks available to write to. The flash controller has to perform “moves” of data from a few blocks that have some valid data and some stale data. These moves are performed to get a few completely full blocks and a new empty block to write to. A move operation ties up the chip and is just a little less work than a write. The amount of over provisioned capacity determines how many background moves you will have to perform for each new write that comes in under the worst possible scenario. For example, on the RamSan-20 Datasheet we list the sustained number for our random writes – 50,000 IOPS. Outside of this worst case you can achieve 160,000 write IOPS. The amount of over provisioned space (~30%) is not arrived at by accident, and roughly 1/3 of peak performance is not a coincidence either. The amount of extra space that is available determines the maximum number of moves that have to be done to get a full empty page – as once all of the spare area is used up, effectively every block will have about as much stall data as the over provisioned percentage. So (ignoring the complexities of the actual math) you have to perform a number of moves that is just a little less than 1/(the over provisioning percent) in the absolute worst case to get a full block to write to. 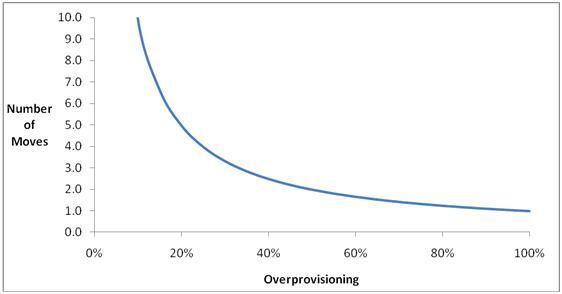 With a very small over provisioning percent, the amount of moves that have to take place can be very high. 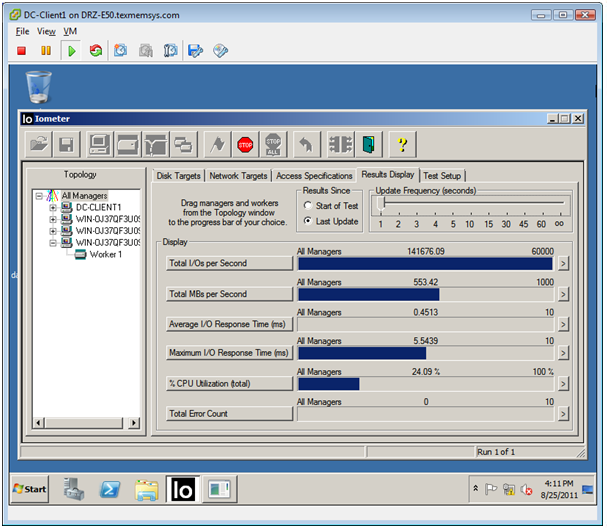 These moves keep the chips busy almost as long as a formal write, so the amount of write IOPS you can perform declines. It is worth noting that, in the real world of applications, you are unlikely to be performing 100% random writes, so a good flash controller will perform background move operations to defragment the valid and stale data. To get to the worst case, you have to randomly write across all of the capacity without ever stopping to read. While some logging applications have this type of constant write workload they are never random. Nevertheless, it is still important to understand this concept to accurately compare different devices’ performance. It is tempting to reduce the amount of over provisioned space to lower the cost per GB, but then the number of worst case moves can become a real problem. Keep in mind that the over provisioned space does shrinks over time as it is also intended to accommodate for flash blocks that have worn out. Some controllers may not actively defragment the space to save on controller costs, so the worst case performance becomes the “real” performance after the drive has been written a few times. This is becoming the exception, but still something to look out for. This performance decline in the sustained random write case can also easily be missed if there is no way for the host driving the workload to keep all of the chips busy all of the time. This is because the decline in performance requires hitting the flash as hard as possible. But with SSDs at a premium price to disks based on their performance, limiting performance all of the time just to avoid a performance decline in the worst case isn’t a good design tradeoff. For more information on write handling, SNIA’s Solid State Storage Initiative’s performance test specification goes into quite a bit of depth.